I am a fan of simple, quick breakfasts for most mornings. I don't mind making a fancy breakfast on the weekend, but on weekdays I like easy. 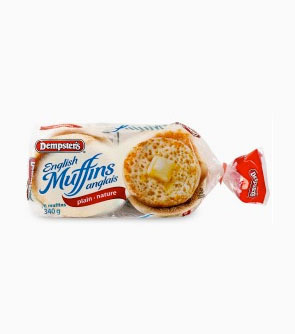 Dempster's English Muffins are a great way to start the day - with so many ways of eating them. My favorite way to eat them is toasted with butter; the butter melts into all the nooks and crannys on the english muffin - YUM! Another way I like to eat them is toasted with a poached egg and slice of bacon on top (but that's more on the weekend). What about you - how do you like to eat your Dempster's English Muffin? Leave me a comment telling me and use the Rafflecopter form below to enter for your chance to win 4 FPC's (2 winners). Giveaway only open to Canada and closes on December 18th. Toased, with an egg and bacon! Toasted with sharp cheddar melted on it. I MAKE MY OWN "MCMUFFINS" WITH THEM! I like them toasted with all the craters filled with drippy margarine. I like to butter it, add a slice of cheese, a fried egg and some ketchup! I like having my english muffin with a sausage patty, egg and cheese. I LOVE Dempsters English muffins, especially the extra crisp flavour. I enjoy a toasted english muffin with butter salsa, a scrambled egg with taco seasoning, salt, & pepper, topped with some cheese. It's sooo yummy, the salsa really adds to a breakfast sandwich! Toasted with egg, bacon and cheese! I love to eat my english muffins with a slice of cheese in between. Toasted with tomatoes, cheese and bacon. We often make mini pizza on english muffins. Toasted with butter and cheddar cheese on top. I like mine in the toaster oven with cream cheese and home made strawberry jam. With egg and bacon on it. Yum! I like making mini pizzas using plain English muffins. with egg and bacon and cheese! Definitely with peanut butter & jam!! Toasted with butter and jam. Toasted until golden brown and melted butter on top. I like mine plain with butter.